Happy Leap Year Day to each of you. 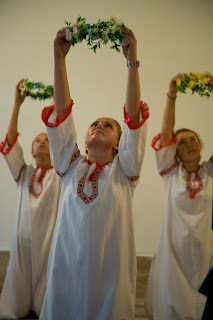 Often, during our delegation trips to Ukraine, children stick letters or notes in our pockets and say, "Give to my sponsor" or "Please pass this onto my friend in the U.S." When we arrive home and try to sort out the notes, we realize that most of them are in Ukrainian and some of them do not have a name. Such is the case of this poem that was written in Ukrainian on a piece of paper with a drawing of cranes in a nest at the top of the paper. Vita, an exchange student from Uzhgorod, who is living in Philomath, Oregon translated this poem for us and we thought you would enjoy reading it. Since we do not know to whom it was intended, it is for all of you. Don't trample down the grass. Look how beautiful our homeland is! Cranes are flying in the sky. So, if you are thinking about coming, we would like to know as soon as possible. We can get reduced airfare by booking early and as a group. Right now, we are planning to fly the new direct Northwest Airlines flight from Portland, Oregon to Amsterdam, Netherlands and then to Budapest, Hungary. From Budapest, we will take a van to Uzhgorod, Ukraine. Sabra Killen is working with a travel agent. Please email her SOON if you are thinking about coming. Her email is rankil@aol.com. If we book early, the airfare cost will be under $1000 per round trip. The Corvallis-Uzhgorod Sister Cities Association board recently voted to approve the allocation of $9000 to purchase a new fence at Public School #14 in Uzhgorod. Currently, the playground for the school is unfenced and used as a pathway for the public. This often creates an unsafe environment for the children when some of those public members may be drunk or hostile. The fence will give these children room to play soccer and other sports in a safe location. We thank the C-USCA for this support of Public School #14. Sara Cropper, a recent college graduate from Ashland, Oregon, is currently in Ukraine volunteering with The T OUCH Project. Sara’s parents, brother, sister-in-law, sister, and brother-in-law are all longtime TOUCH sponsors and she decided that she would like to go to Ukraine and volunteer to work with these children for about 6 weeks. Sara has been busy teaching English to the children at the Chaslivtsi Orphanage, rocking abandoned newborn babies at the Children’s Hospital in Uzhgorod, and visiting the public high schools. We thank Sara for this gift of her time and expenses. 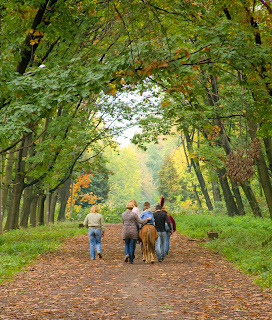 pony rides on a fall afternoon in Uzhgorod. 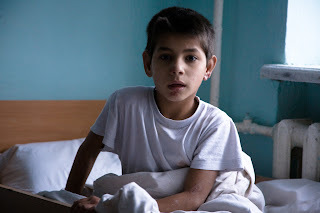 Young girl at the Chaslivtsi Orphanage. from the Chaslivtsi Orphanage embroidery class.